An 83-year old grandmother raising her two grandchildren alone is need of aid. Her grandchildren have lost their parents, making her the sole provider. However her age and frailty do not allow her to do much substantial work. The grandmother receives 200,000krw each month in welfare and adds a little to that through the odd jobs she can find. However, this is not enough. The family is in dire need of help; a fact that can be especially prevalent through the winter months when the only heat the family had was shared through a single electric blanket - which was the case until they became a Jeju Furey beneficiary. A 53-year old is single-handedly raising his 14-year old son and caring for his 75-year old mother. Suffering from a spinal injury he cannot find much work to supplement the 293,000krw monthly income he receives in welfare and disability. His son also suffers from an atrial septal defect in the left ventricle of his heart along with a hole in the right side which greatly affects the supply and discharge of blood. 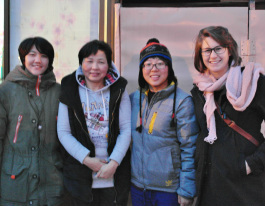 By participating in Jeju Furey events, purchasing apparel, raffle tickets, and food, you will be helping in a big way to provide this family with a reasonable standard of living. Both families receive the funds raised by Furey in cash to enable them to achieve that standard. and he requested for aid through the livelihood security act. He could not afford his 2,500,000krw annual housing rent so he had to sell one of his musical instruments. An elderly woman, born in 1931, significantly immobile, takes care of her son who is physically disabled, and cannot afford the 500,000krw for annual housing rent. An elderly woman, born in 1949, has asthma an cannot afford the 500,000 she needs for annual housing rent. Christmas gifts and had a Christmas Day party. All the orphans who wanted Christmas gifts, received one. All 67 or so orphans received Christmas gifts and had a Christmas Day party. All 66 or so orphans received Christmas gifts and had a Christmas Day party. 2012 :: 6,405,871krw raised to get Christmas gifts for all the orphans on Jeju Island. 2011 :: 415,000krw raised to get Christmas gifts for orphans at two orphanages on Jeju Island. On Friday March 13th, 2009, Nathan Furey passed away leaving behind two sons: 2-year old, Juno (left) and 1-year old, Noah (right). The foreign community sprang into action and through a variety of fund raising efforts was able to collect over 20,000,000won (CAD/USD $20,000) and gave it to Nathan's widowed wife, Hyo'jung. Hyo'jung has since moved herself, Juno, and Noah to Canada to live with Nathan's parents, Betty and James. There, Hyojung has started a career as a chef in one of Vancouver's top restaurants and the boys attend school. The money has been put into a trust fund, one in which the Canadian government adds $2,000 for every $5,000 deposited. This means that the trust fund has a starting value of $28,000. In addition to the efforts that took place in Jeju, Nathan's friends in Canada also did some fundraising and collected an additional $20,000 ($28,000 after the government increases). Therefore, by the time Juno and Noah are ready to attend university in 2024~25, they will be off to a very strong start financially. The family is eternally grateful to the hundreds of individuals who made contributions and donations and are proud to see their son's name live on through this organization. It takes a whole lot of people to make the magic of Jeju Furey happen. The communities come together and create these events that people enjoy and that do a lot of good for people in need.